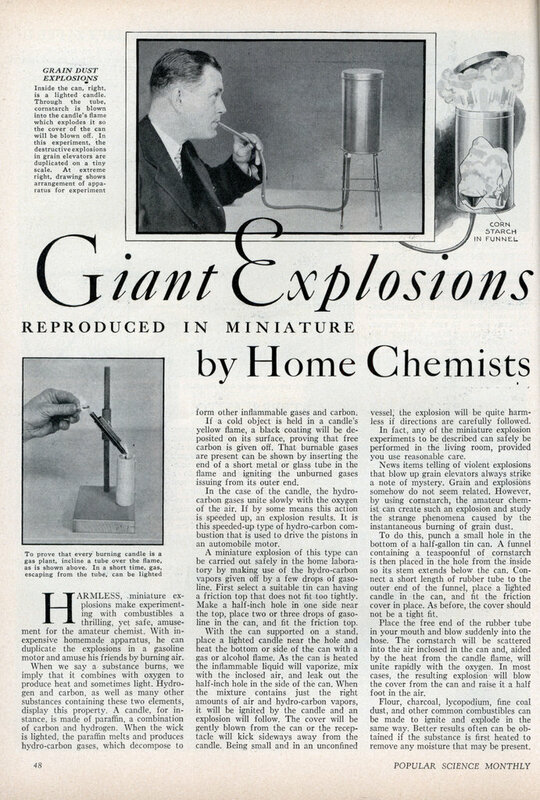 HARMLESS, miniature explosions make experimenting with combustibles a thrilling, yet safe, amusement for the amateur chemist. With inexpensive homemade apparatus, he can duplicate the explosions in a gasoline motor and amuse his friends by burning air. When we say a substance burns, we imply that it combines with oxygen to produce heat and sometimes light. Hydrogen and carbon, as well as many other substances containing these two elements, display this property. A candle, for instance, is made of paraffin, a combination of carbon and hydrogen. When the wick is lighted, the paraffin melts and produces hydro-carbon gases, which decompose to form other inflammable gases and carbon. If a cold object is held in a candle’s yellow flame, a black coating will be deposited on its surface, proving that free carbon is given off. That burnable gases are present can be shown by inserting the end of a short metal or glass tube in the flame and igniting the unburned gases issuing from its outer end. In the case of the candle, the hydrocarbon gases unite slowly with the oxygen of the air. If by some means this action is speeded up, an explosion results. It is this speeded-up type of hydro-carbon combustion that is used to drive the pistons in an automobile motor. A miniature explosion of this type can be carried out safely in the home laboratory by making use of the hydro-carbon vapors given off by a few drops of gasoline. First select a suitable tin can having a friction top that does not fit too tightly. Make a half-inch hole in one side near the top, place two or three drops of gasoline in the can, and fit the friction top. With the can supported on a stand, place a lighted candle near the hole and heat the bottom or side of the can with a gas or alcohol flame. As the can is heated the inflammable liquid will vaporize, mix with the inclosed air, and leak out the half-inch hole in the side of the can. When the mixture contains just the right amounts of air and hydro-carbon vapors, it will be ignited by the candle and an explosion will follow. The cover will be gently blown from the can or the receptacle will kick sideways away from the candle. Being small and in an unconfined vessel, the explosion will be quite harmless if directions are carefully followed. In fact, any of the miniature explosion experiments to be described can safely be performed in the living room, provided you use reasonable care. News items telling of violent explosions that blow up grain elevators always strike a note of mystery. Grain and explosions somehow do not seem related. However, by using cornstarch, the amateur chemist can create such an explosion and study the strange phenomena caused by the instantaneous burning of grain dust. To do this, punch a small hole in the bottom of a half-gallon tin can. A funnel containing a teaspoonful of cornstarch is then placed in the hole from the inside so its stem extends below the can. Connect a short length of rubber tube to the outer end of the funnel, place a lighted candle in the can, and fit the friction cover in place. As before, the cover should not be a tight fit. Place the free end of the rubber tube in your mouth and blow suddenly into the hose. The cornstarch will be scattered into the air inclosed in the can and, aided by the heat from the candle flame, will unite rapidly with the oxygen. In most cases, the resulting explosion will blow the cover from the can and raise it a half foot in the air. Flour, charcoal, lycopodium, fine coal dust, and other common combustibles can be made to ignite and explode in the same way. Better results often can be obtained if the substance is first heated to remove any moisture that may be present. Although these experiments tend to show that all substances containing carbon or hydrogen are inflammable or explosive, this is not the case. Carbon tetrachloride, for instance, is a combination of carbon and chlorine used for extinguishing fires and, as a cleaning fluid that will not burn, it is used in place of gasoline and benzine. Instead of exploding or burning, carbon tetrachloride decomposes when held near a flame. To illustrate this, moisten a small wad of cotton with the liquid and hold it around the base of an oil lamp or lantern. The vapors will be decomposed and the carbon liberated will condense on the glass globe as a black coating. If the moistened cotton is held at the air ports in the base of a Bunsen burner and a copper wire is held in the normally blue flame, the flame will change to a bluish-green. This color change is caused by the chlorine given off when the carbon tetrachloride decomposes. The chlorine unites with the copper and then breaks down again to form copper vapor and chlorine gas. If a cold, white surface, such as the bowl of a bubble pipe, is held in the bluish-green flame, a visible coating of the copper will be deposited on it. One would hardly expect to burn air. Yet, with a simple arrangement of parts consisting of a lamp chimney, some plaster board, a few pieces of glass tubing, and several feet of rubber hose, the home chemist can do just this. Support the glass lamp chimney on a sheet of plaster board fitted with two glass or metal tubes, one fourth inch in diameter. The tubes, about three inches long, should extend up into the chimney about half their length. When the chimney has been wired or otherwise fixed in position to prevent it from toppling over, place over the chimney top a sheet of plaster board having a half-inch hole in its center as is shown. Place a finger over the hole in the plaster board capping the chimney and turn on the gas. After a half minute, light the gas issuing from the free tube under the chimney, turn the gas low, and remove your finger from the upper hole. 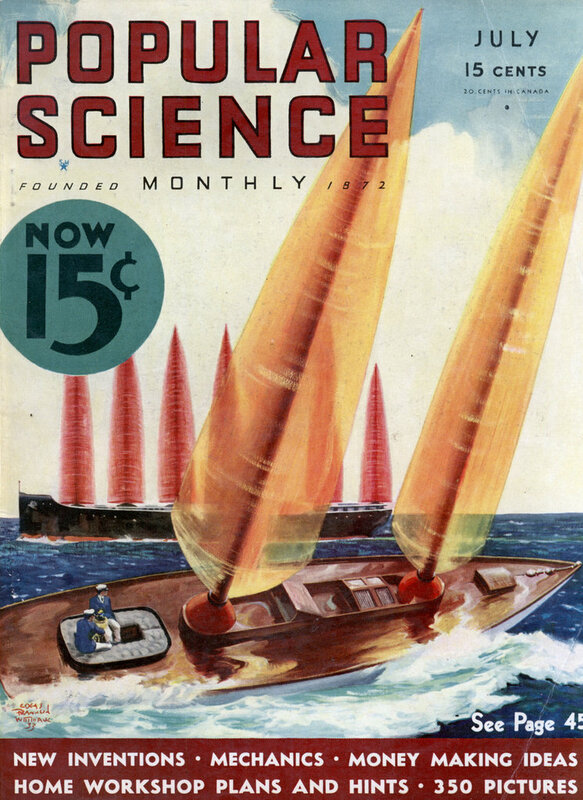 At first, the gas will burn outside the lower tube. When the finger is removed, however, the flame will travel up the inside of the tube and appear at the end of the tube inside the chimney. With the bottom end of this tube open to the air, the flame in reality is caused by the air burning in an atmosphere of gas. This type of action is called a “reciprocal combustion.” Since combustion is the combination of a flammable substance with oxygen, either will burn in an atmosphere of the other. This same arrangement of parts can be used to show, in a rather unique way, that gas becomes explosive only when mixed with oxygen. After completely ventilating the chimney to remove all the gas, place a finger over the outer end of the free air tube and allow only pure gas to enter the chimney. After about a half minute, light the gas issuing from the hole in the plaster board chimney cover. Then shut off the gas and remove your finger from the bottom tube. The gas in the chimney will rise and continue to burn at the hole in the plaster board. Since air also will enter the chimney through the opened bottom hole, the chimney soon contains a mixture of gas and air. When this mixture is composed of just the right proportions of each, the flame burning outside will suddenly dart into the chimney and cause the air-gas mixture to explode with a harmless swish. In most cases, the explosion will not be violent enough to blow the loose plaster board cap from the chimney. However, as a precaution, do not under any condition fasten the plaster board firmly in place. A novel magic flame, more sensitive to sounds than our own ears, forms one of the most amusing experiments the home chemist can perform. A gallon or half-gallon bottle serves nicely for this experiment. Fit it with a cork supplied with two short glass tubes and connect the gas supply to one and a rubber hose fitted with the glass portion of a medicine dropper to the other. After waiting for the air to be driven out of the system light the gas at the tip of the medicine dropper. With the gas turned on full, the flame will roar. Then place a suitable pinch clamp over the rubber tube leading to the inlet of the bottle and throttle the gas gradually until the flame burns less violently and ceases to roar. In this condition the flame will be sensitive to the faintest vibrations. Every noise will cause the flame to duck. Even the slight scratching noise made when striking a match will cause the sensitive flame to dart. By experimenting you will find that high-pitched sounds cause the flame to shorten or dodge more than low notes. A flame of this type is so sensitive that it responds to vibrations so rapid (high-pitched) that they cannot be heard by the human ear.